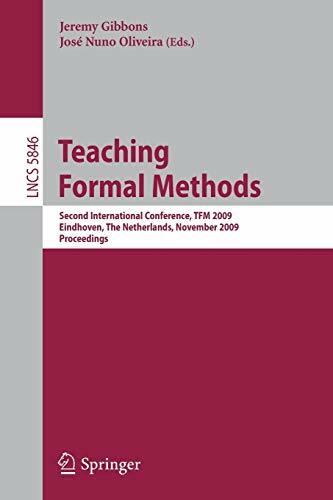 This volume contains the proceedings of TFM2009, the Second International FME Conference on Teaching Formal Methods, organized by the Subgroup of Education of the Formal Methods Europe (FME) association. The conference took place as part of the ?rst Formal Methods Week (FMWeek), held in Ei- hoven, The Netherlands, in November 2009. TFM2009 was a one-day forum in which to explore the successes and fa- ures of formal method (FM) education, and to promote cooperative projects to further educationand training in FMs. The organizersgatheredlecturers,tea- ers,andindustrialpartnersto discusstheir experience,presenttheir pedagogical methodologies, and explore best practices. Interest in FM teaching is growing. TFM2009 followed in a series of events on teaching FMs which includes two BCS-FACS TFM workshops (Oxford in 2003, and London in 2006), the TFM2004 conference (Ghent, 2004, with p- ceedings published as Springer LNCS Volume 3294), the FM-Ed 2006 workshop (Hamilton, co-located with FM2006), FORMED (Budapest, at ETAPS2008), and FMET2008 (Kitakyushu, co-located with ICFEM2008). FMs have an important role to play in the development of complex c- puting systems―a role acknowledged in industrial standards such as IEC61508 and ISO/IEC15408, and in the increasing use of precise modelling notations, semantic markup languages, and model-driven techniques. There is a growing need for software engineers who can work e?ectively with simple, mathematical abstractions, and with practical notions of inference and proof. This book constitutes the refereed proceedings of the TFM 2009, held in Eindhoven, The Netherlands in November 2009. The 10 revised full papers presented together with an abstracts of invited talk were carefully reviewed and selected from 19 submissions. The papers presented explore the experiences of teaching FMs, both successful and unsuccessful, educational resources including the use of books, case studies and the internet, the education of weak and mathphobic students, the integration, or otherwise, of FMs into the curriculum, including, contributions to the definition of a Formal Methods Body of Knowledge (FMBOK), the advantages of FM-trained graduates in the workplace, changing attitudes towards FMs in students, academic staff and practitioners and the necessary mathematical background.